After purchasing the T3 Whirl Trio I was able to give away and donate all 5 of my previous hot tools. This one tool had everything I needed! I had much more room in my hot tools drawer after switching to the T3 Whirl Trio. Not to mention I no longer had to untangle a pile of curling irons! Picture a cheesy infomercial of the person screaming/crying at the tangled cords, then smiling as she reached in for her T3 curling iron.. that was seriously me. I love being able to travel with one hot tool. I felt really extra bringing two different curling irons and it took up more room in my suitcase. With this I can put different barrels in one travel friendly bag and I love having a few options for my look. I was also surprised by the weight difference, so it you struggle with staying under #50 for your checked luggage it makes a big difference! There really isn’t a way to test this, but this is the main reason it’s worth investing in more expensive hot tools. If the barrel of your curling iron isn’t heated evenly, it will cause your curls to fall out and create uneven waves. The T3 Whirl Trio heats up really quickly. By the time I apply dry shampoo and brush and section off my hair it’s ready to curl. The tip design is really my only negative for the T3…the good news is they changed the design based on feedback. Both designs have a tip on the end to keep the hot barrel from touching the counter, but the old design is aligned perpendicular to the barrel.. causing your hair to catch when sliding your hair off the end. It’s the most noticeable when using the larger 1.5 inch barrel, because it has to stick out further. If you own the barrels with this tip, you can avoid it by unwinding the end slightly to open up the curl as you take it off. Just be aware of the tip once you purchase to make sure you got a newer version (the new tip is white instead of rose gold). This is a picky request, but I do with the travel bag that came with it wasn’t black or it was a different material. My bag has rarely been used but it is covered in blonde hair from sitting it on the ground. 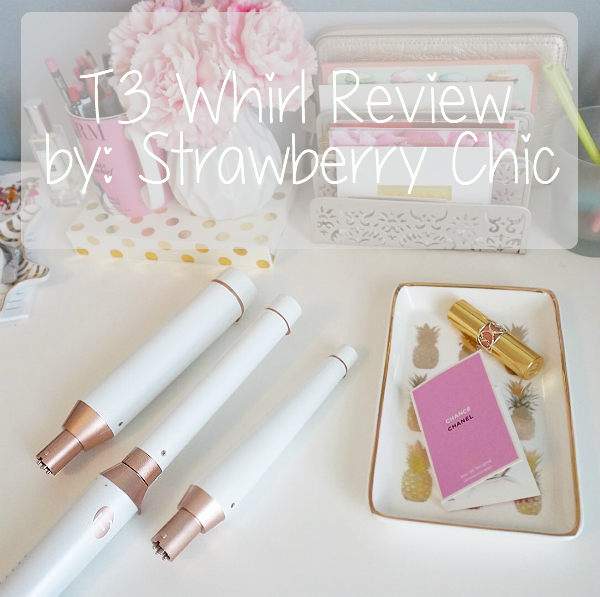 This isn’t particular to the T3 Whirl Trio, but if you’re new to using a wand vs a curling iron you may need some practice. Especially if your hair is really layered! The shorter ends will stick out as you continue to wrap the longer layers. Usually, I just let them do their thing and I don’t really notice in the final product, especially if you’re wanting textured waves/curls. Your fingers are close to a hot iron, so wear the glove until you get used to it! I only use the glove occasionally when I want really polished curls throughout the entire strand or if I’m switching the barrels. The glove can also take some practice because you can’t feel the hair in your hand. Once you get the hang of using curling wands, curling your hair is much faster than when using a curling iron in my opinion. I have to mention this because the T3 Whirl Trio is definitely an investment. Personally, I curl my hair 4-6 days a week, so I wanted to invest in a good tool that will last and be the safest on my hair. 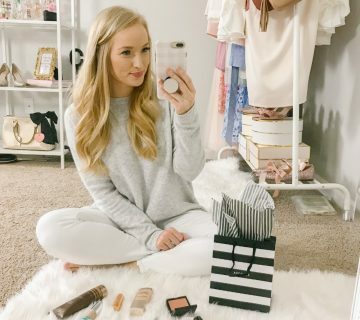 I purchased mine turning a Black Friday sale, so if you want to save the most amount of money look to purchase it during that time or put it on your gifting wishlist! 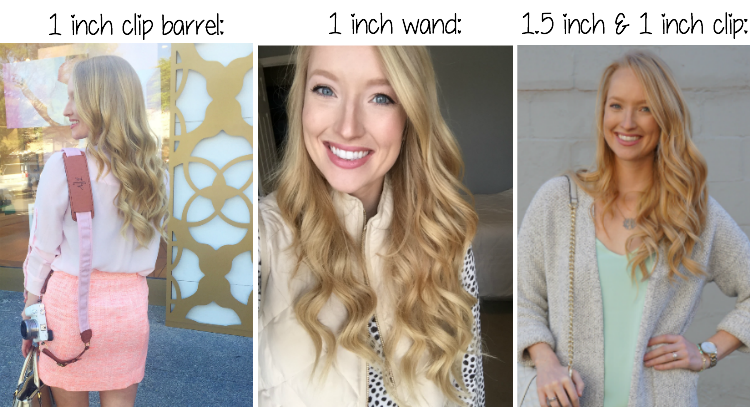 If you have hard to curl hair start with this wand! Because of the tapered shape, it will hold curl better. This wand will give you beachy waves. This is my most used barrel. You can get two different looks with it based on how you twist your hair around the barrel. For defined, bouncy curls wrap your hair around the barrel and make sure it doesn’t twist. If you want wavier hair wrap your hair around it and let it twist as you go. This wand is used to body at the ends. On my hair this will fall out almost right away, but I love it when I’m wearing hair extensions for big curls. Here are three photos using different T3 barrels, along with a quick instruction to achieve the look! For the first picture on the left, I took bigger sections of hair with the 1-inch clip barrel. Curling the ends will give you a more polished/classic look. You could also use the 1inch wand with the glove to get this look. Just wrap larger sections of hair flat around the barrel. For the middle look, I wrapped 1-inch sections of my hair around the 1-inch wand and left out about an inch at the ends. 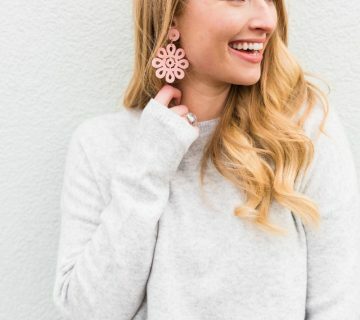 This will give you more of an undone/effortless look, which I really like for the summer time or third day hair (or fourth.. no judgements here). The picture on the right is my favorite but takes the most time. To get these bouncy curls, I use the 1.5-inch barrel on my extensions and the 1-inch on my top section. I hold the large curls in my hand for a good 10 seconds to reinforce the curl as it cools. I usually pick up the mess I made while getting ready to let the first iron cool down, then use the heat glove to switch the barrels just to be safe. I use the smaller clip on the top because my hair doesn’t hold the larger barrel, and brush out just the top to blend.